The JH-M31032C is a modular CMTS designed for manufacturers of HFC transmission equipment. 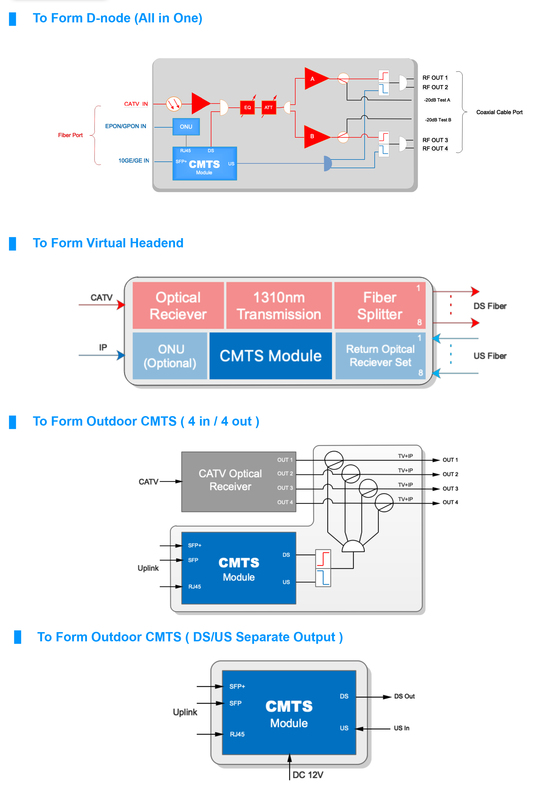 It can be used to form products such as outdoor CMTS, D-node, and virtual front end device. The module is combined with an optical receiver to upgrade the traditional fiber node equipment and achieve a revolutionary breakthrough in functionality. It becomes a full-service optical station that integrates CATV and IP data hybrid transmission, which can greatly increase the added value of the product. 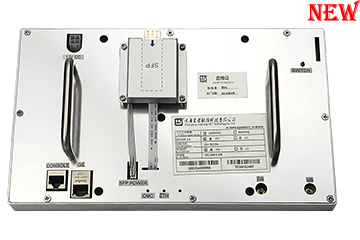 It combines with an optical receiver/optical transmitter to form an outdoor virtual front-end device that can be deployed outdoors to save on the cost of renting a equipment room. The JH-M31032C has a full CMTS function with a compact housing and the necessary interfaces. It is small in size and easy to install and fix. Jinghong offers whole solution for various tailor made requests from cooperative partners. ◆ Compliant with DOCSIS3.0/Euro-DOCSIS3.0/C-DOCSIS standards. ◆ DS*32, it can be easily configured to 64/256/1024QAM modulation mode with a maximum data rate of 2Gbps@1024QAM. ◆ US*10, it can be easily configured to QPSK/3~8 order QAM modulation mode, with the maximum a data rate of 400Mbps@256QAM. ◆ The number of channel bundles can be easily changed to facilitate the operator's planning and utilization of frequency resources. ◆ Maximum 1000 CMs simultaneous online. ◆ Supports layer 3 routing, static route, policy route, VLAN, L2VPN, ACL etc. ◆ Built-in DHCP/TFTP/ToD server, supports for DHCP relay, and multiple subnet subnets under CPE. Option 82/60 is supported. ◆ Both US and DS channels can achieve load balancing based on CM quantity (static) or traffic (dynamic) to ensure effective utilization of bandwidth resources. ◆ Supports IPv6, multicast, remote-query, Flap (DOCSIS signal quality jitters diagnosis), etc. ◆ The US/DS service classifiers are used to implement the service flow-based QoS mechanism to ensure the bandwidth and delay requirements of various services. ◆ Security: BPI+, CM authentication, anti-DoS attack, user isolation, IP source address check, and more. 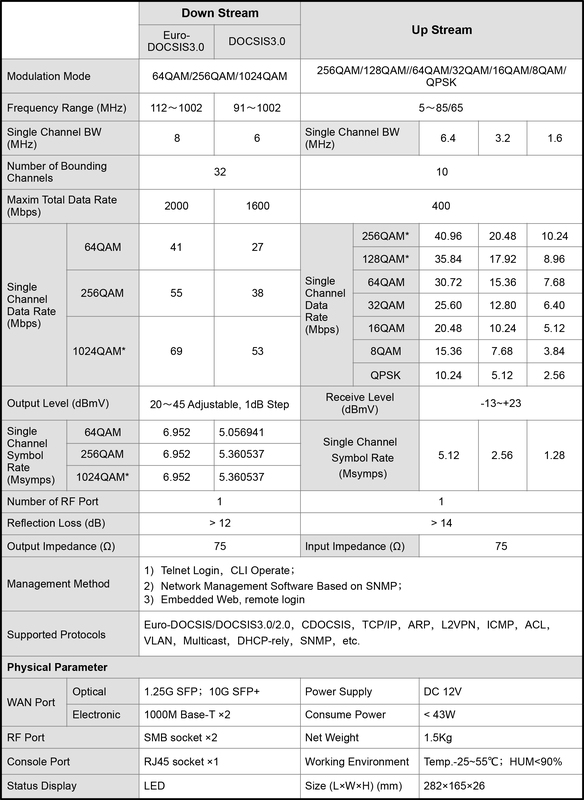 ◆ Upstream channel spectrum analysis. ◆ Three ways to manage: CLI, embedded web, SNMP. ◆ Support remote management and update.